Well that was an excellent race at @BMSupdates. If you weren't here, you missed out ?? 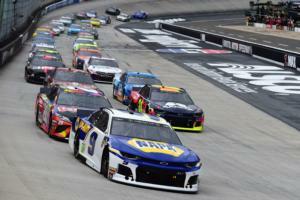 I hope today's race is enough to put fans in the stands for the August race @BMSupdates. I believe the #NASCAR fans received their money's worth and were treated to a fantastic weekend in Thunder Valley. Can't ask for more short tracks and not show up IMHO ?? Was Bristol a good race? Haven't seen a better race than that in a long, long time. More short tracks please! That was the Cup race of the year so far. I love that place. I don't know about you all. But this @BMSupdates had me on the edge of my seat all race long!! KB doing KB things at the end of that one. I took my daughter for her first @BMSupdates race yesterday. We had a BLAST! Everyone commenting on how empty the place was, you ARE the problem. Get yourself to a race, sit your a** in the seat... this will keep you from talking out of it about the racing not being good. I don’t give them out often, but what a weekend of racing @BMSupdates!! I can’t remember the last time i’ve had that much fun. MULTI-Groove racing all day! The Cup race was AWESOME to watch too! Well done, thank you... Oh and it’s always fun with a fast car @KauligRacing ?? Just got home from @BMSupdates and what a race! TV does not do justice of all the battles happening on track. Best racing of the year by far and I cannot wait for the fall race! EASILY best Stage 1 of the season in any Cup race. My eyes didn't deceive me.